Shaping Little Souls: Yes! Jesus Loves Me! Last week I watched my friend's school age children because they had their mid-winter break. I witnessed a sad and eye opening fact of our kids in today's churches. My 2 year old has a stuffed animal that sings "Jesus love me this I know, for the Bible tells me so..." (and so on), when you press the button on his tummy. Well the kids pressed the button and the kids stopped to listen. Then one child said to her brother, "What movie is that from?" And they were racking their brain to think of where they had heard that song! I was bumbfounded! What? These kids have been going to church for the 8 to 13 years they have been alive and they don't know the song Jesus Loves Me? I was sick. SING TO YOUR CHILDREN! Sing to them simple Sunday school songs! Sing to them old hymns of the faith! Sing to them modern day worship music. Sing unto the Lord!!!! If you teach a sunday school class, SING JESUS LOVES ME! If you don't teach them who will? I agree, however these modern worship songs are often kind of lame (meaning they sound more like generic love songs and often don't even name Christ in them). The old hymns of the faith have the meat that holds the Christian together woven into them! If these kids have indeed been in church for a long time and don't know Jesus Loves Me, then they're probably being sung something generic;. I also love the old hymns and have soung them at home with our children. However I know I consciously taught our older ones more hymns than the younger ones as the Parish's we went to sang the older hymns. It is harder to remember the hymns for me as I can't read music and have to rely on memory for the tume. 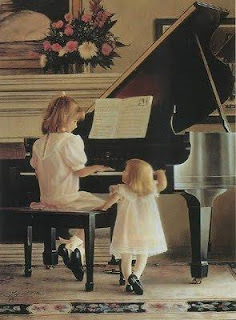 However I still try to teach the hymns with the children and I find the best way is to just sing them when we are together. Car trips are also great ways to pass the time singing. I stopped by from the Homeschool Lounge to say hi! I love what I have read so far, the singing to your kids, to your philosophy on discipline.